FAYETTEVILLE, Ark. 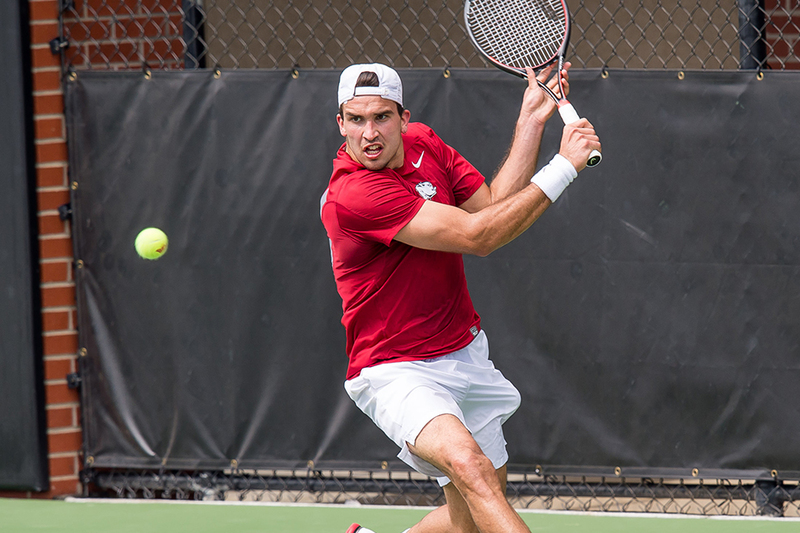 – Fresh off its first ranked win of the season, the Arkansas men’s tennis teams travels to the east coast for a three-match road swing this week. The week begins with a match against the Central Florida Knights on Wednesday at 4 p.m. CT at the USTA National Campus in Orlando, Florida. Arkansas will quickly get back into conference action, as the Razorbacks will then travel north to Columbia, South Carolina, for a matchup with the South Carolina Gamecocks on Friday at 3:30 p.m. CT. The Razorbacks will close out the road trip with a match in Gainesville, Florida, on Sunday, as Arkansas takes on the No. 9 Florida Gators at 11 a.m. CT.
Last week, the Razorbacks split a pair of SEC matches at home, as Arkansas fell to the Tennessee Volunteers last Friday 4-3, before defeating the No. 14 Georgia Bulldogs 4-3 on Sunday for the first time in 14 years. For more information on Razorback men’s tennis, please follow @RazorbackMTEN on Twitter.